Welcome back to a world of horror and fright. You may remember last year when I did a review of a game that not many would think of when pondering the options to step into a good atmosphere that sends chills down spines and squeals up throats. Thief: The Dark Project was that game, and the horror came from the masterpiece’s years spent in development hell when its focus was changed about a half dozen times. Well, if you want to read more about that game check it out right here: https://whydidiplaythis.wordpress.com/2014/01/02/unexpectedly-spooky-thief-the-dark-project/ . In contrast to a jumbled mess of juxtaposed design and experimentation that somehow worked brilliantly, this year I bring you D. Just D. The letter D. No more. No less. 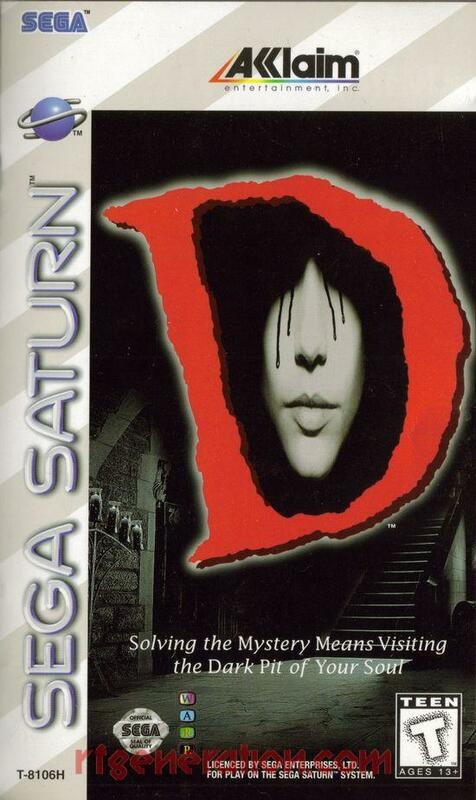 D.
D is a horror puzzle game developed by WARP and published by Acclaim. It was originally created and released on the 3DO, but given the system’s less than stellar sales records, the game was ported over to Sega’s Saturn and Sony’s Playstation, as well as DOS in the Western markets. In Japan, the Saturn release was a smash hit, debuting at the top of the sales chart. Acclaim insisted on porting it over to the other consoles themselves, and localizing it for the international market. The Saturn port was also successful on the sales charts in the West despite that console’s lukewarm reception. Sadly, Sony did not manufacture enough copies to even dream of satisfing pre-order demands for the Playstation release, and few more were ever produced. This leads to the oddity of the Saturn version being the easiest to find in the US. There’s not too much difference in price between the two though, Saturn averages out to be cheaper. The 3DO version stands up as the hardest to find and most expensive release. I blame this on the fact that searching for just “D” leads to so many other results that its annoying to find this specific game for any of its systems. The game’s development is a wonderful tale in and of itself, with Kenji Eno going to extreme lengths to keep the real story of the game hidden, even from his coworkers, in an attempt to sort of cheat his way into a publishing deal. He made the game appear more like it was a clean cut adventure game with high quality graphics, not unlike Myst before it. Since Kenji Eno personally visited manufacturers in the USA to switch out his clean version from the real version he also bypassed any possibility of censorship. Even today the horror imagery and well detailed (for the time) art design and environments stand out among its peers in the genre. Where Resident Evil would release after this game and rely on bad voice acting and jump scares, D does an excellent job of instilling a creepy atmosphere around the player and the young woman you control, WARP’s digital actress Laura Harris. One interesting way that this atmosphere was achieved is a design choice that forces the player to sit and play the game. There is no saving or pausing. You have two hours of real time to finish the game from start to ending. That may seem like a short time, but I ended up being about ten minutes shy of beating it when I first played it. The second time was the charm for me. One of the reasons you might get stopped and take a bit longer to finish the game is the puzzle design. Its quite reminiscent of point and click adventure games, but given its short length, most of these puzzles lack the depth or insane difficulty of some PC adventure games that are similar to D’s presentation. The exploration and movement works well for being limited to a controller. The odd part about the game’s movement design is that some rooms have paths that go all over the place. One example of this is in one of the bedrooms. You’ll step inside and be looking at a painting, and you can only walk towards this painting at first. Later you’ll need to get into a table to the right of the painting, but to get to the table from the painting you have to turn left, walk to the other door, then turn and step to the bed, turn to the left again, and then step forward to the table. You can’t just turn right when you’re already standing next to the table. The game certainly feels aged though. Compared to other horror games its quite tame. As you play you’ll find the atmosphere is where the real tension is, and there are some creepy images and unexplained phenomena throughout this mansion Laura finds herself in. The occasional dessicated corpse catches her by surprise, and a wall of spikes early in the game might be only real jump scares in the game, but none of them are harmful. This game did influence later titles when it comes to presentation though. D’s unexpected success in all markets is simultaneously a beginning and an ending, as slower FMV puzzle games were nearing their twilight. D’s future influence lies in its tight artistic designs, well produced visuals, and its use of sound to create a setting and experience that will stick to the player. Its length actually helps it in this case. Since the game is so short everything that happens gets stuck in your mind, and you’ll rarely find yourself scratching your chin trying to remember something like you might with a long winded RPG or even other horror games! If you have about $20-40 burning up your pocket or paypal balance, and you want a good, creepy experience that doesn’t require a long term commitment, then D is a fantastic purchase.